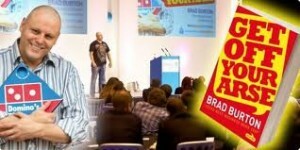 Business Celebrity interview: Brad Burton MD of 4N networking, Author, Speaker, & Action man! You may find his style quite bold... but that's just Brad being authentic! What you see is most definitely what you get with Brad Burton MD of 4N Networking and authour of the not so subtlety titled (but actually rather good) business book 'GOYA' (Get off Your Arse!). An absolute believer in walking the walk and talking the talk, Brad dispenses advice he knows works as he's done it himself. When he started out in business Brad was no stranger to sitting in his underpants 'aggressively waiting for the phone to ring' (!) in between diving down the sofa for loose change, and delivering pizza so his family could eat. This is proper rags to riches stuff, and shows you the power of a great business celebrity story that includes both credibility and vulnerability. Now an international business megastar (you can pay me later for that title Brad! ), Brad is out there on national TV, radio (BBC working lunch, Radio 2 etc etc) and has literally changed the lives of thousands of business owners through the success of 4N. Highly sought after as a motivational speaker, which I know from being in the audience he is hilarious, poignant, perceptive and really very good at, Brad is a Business Celebrity. Never resting on his laurels, always out there pushing it for a bigger spotlight, or a new stage (4N is now expanding globally), Brad is a great example of how when you put your mind to shining, you stand out in your market. what he thinks of marketing plans! Enjoy the interview and if you're not already a member of 4N then I'd personally recommend you join (tell Brad I sent you!). Great interview, Brad is a whirlwind of ideas and real life examples. Straight to Amazon to buy the book, Cheers! Think Big! Next post: When was the last time you did something HUGE? Now I love cheese. Nothing gets me more excited than a cheeseboard of stinky, oozy, mouldy cheese and some delicious crackers BUT I am so over the cheese when it comes to marketing. WARNING: This may turn into a bit of a rant. Lucy really does know her stuff, but more importantly she works in such a way that you feel understood, challenged in a good way, and fully supported. The confirmation of how I can market in a way that feels right, is easier and more authentically me, have had a profound effect. I have no hesitation in recommending her work and would like to say a public Thank You to Lucy from me – it’s great to have you in my corner and in my network! Today I went for my first ‘proper’ run in a long time (that’s running for the sake of running, not because I’m cutting it fine to catch my train). I’m married to a ‘proper runner’ who ‘pops out for a 10k’ 2 or 3 times a week, so it’s a little intimidating when I know my ‘run’ could be outpaced by a walk at times. But when you decide on something you want to do, it’s a good idea to just do it–any way you can.